One of the best things about Hamburgers is they can be found anywhere. It’s practically a universal cuisine item and can be made in your backyard, on a flat top griddle, prepared Mexican style, made of Steak carvings, Vegetables, formed into Spring Rolls, served at Seafood restaurants, road side stands, all the way from the bottom of the world, to the top. Burgers, much like Elvis, are everywhere. 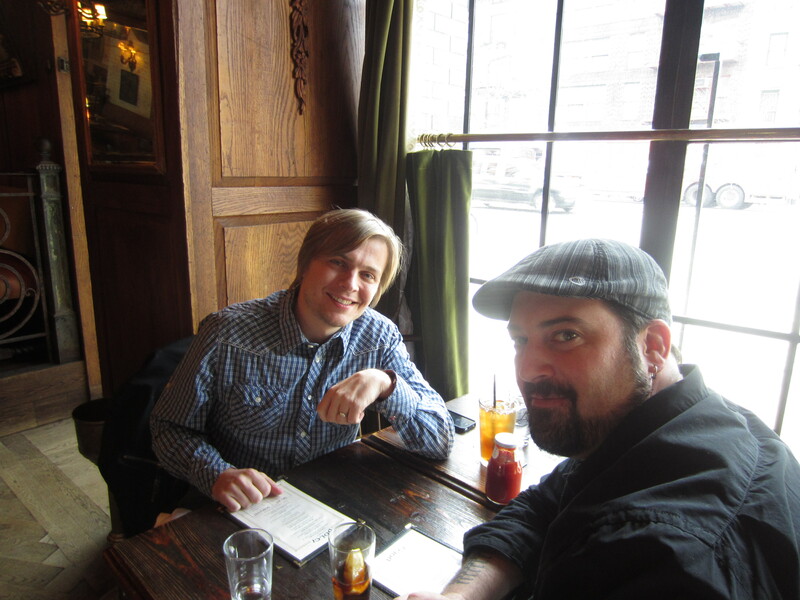 When my friend Joe recently suggested we link up for a lunch time catch up, his idea to eat at an Italian restaurant, provided the ability to prove the theory. 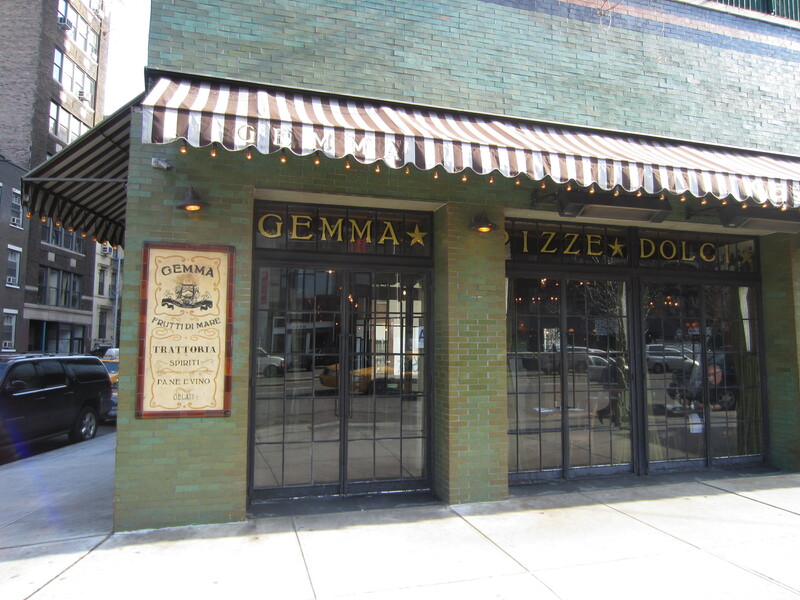 Located right up the block from the former legendary music space CBGB, you’ll find Gemma. 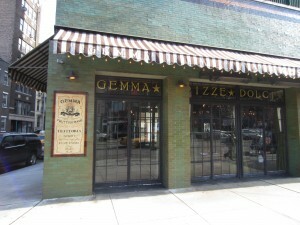 It’s an Italian restaurant located on the North West corner of the Bowery Hotel. It’s open for Breakfast, Lunch, Dinner, Cocktails, Dessert and in the warmer months, outdoor dining. The Dinner & Lunch menus in this rustic feeling bistro are virtually the same with the exception of an additional offerings of Paninis for the faster moving Lunch crowd. It’s a simple best-of mix of new-era Italian faves like Pizze, Paste, Salumi, Fromaggi, Antipaste, Insalate & Crostini’s. It’s a be seen kind of place that is shortly becoming part of the New York experience again, hotel dining for locals. There is however one BIG difference between the two menus and that’s the Bowery Burger. 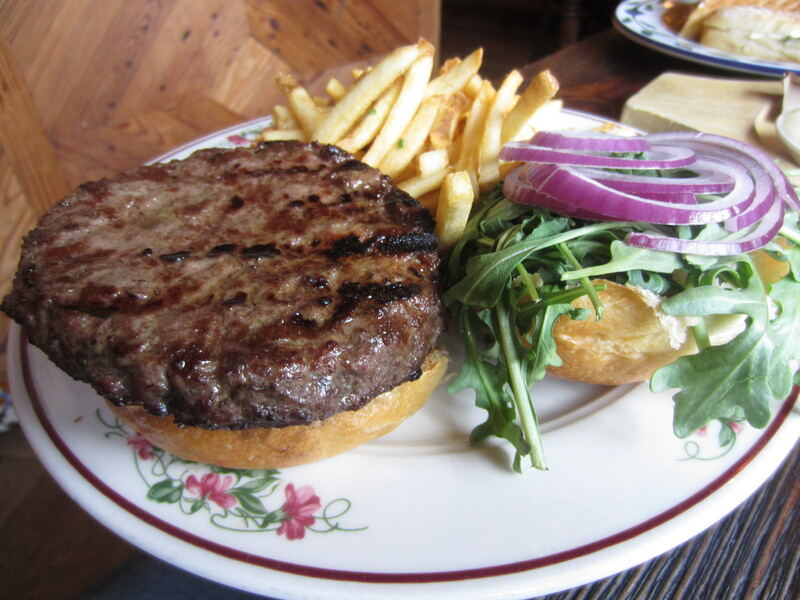 It’s made of 100% Black Angus Beef and served with Greens, Red Onions, Tomato and Fries. I of course go sans “Tomate” and asked for it to be cooked Medium-Rare. While the Burger that arrived on my plate looked fantastic on the outside, the char marks were a sad indicator that the inside was closer to a Medium-Well. The Burger tasted exactly of that, a char grill cooking method of cooking to a Patty made of fresh ground Beef. I liked the Fresh Greens and while Red Onions can often be a bit too much for a Burger, in this case they added flavor where I would normally hope for a slice of Cheese. The Bun to Burger ratio was appropriate but despite all of the dressings, this Burger didn’t live up to what I had hoped. That aside, if you check into a meal at Gemma, there is one item not to be missed. Be sure, and I mean it, to get an order of the Truffle Polenta Fries. This delectable treat is fantastic! They form the Polenta (made with cornmeal) into long sticks that resemble Sweet Potato Fries and cover them in Garnish and Truffle Oil. It’s served with two sauces, one reminiscent of a spicy Thousand Island and also a Creamy Alfredo dip. Both Sauces are savory and delicious, especially the latter. 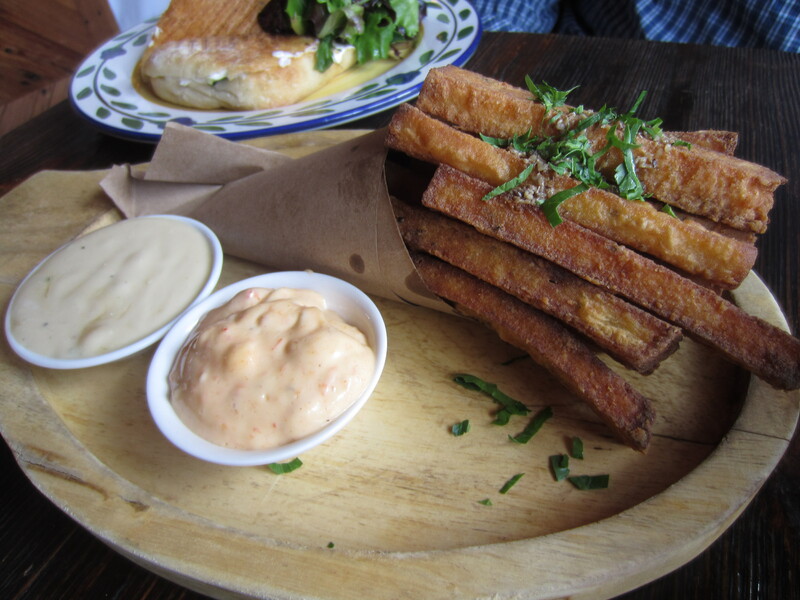 The Polenta Fries themselves are a work of side item Food art; warm, crispy on the outside, soft on the inside and packed with taste. 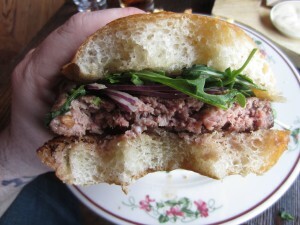 For a restaurant known for serving great Food to a great crowd, the Burger was a let down. 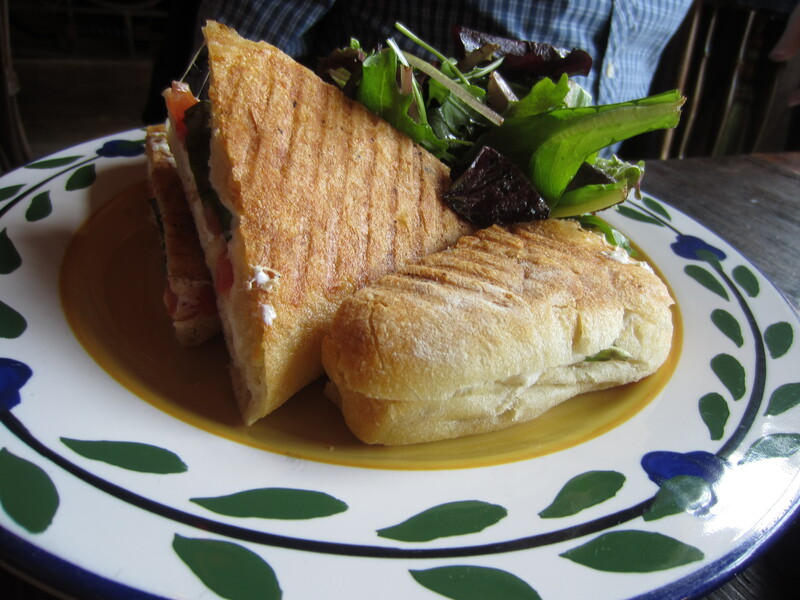 Perhaps I should’ve followed Joe’s example and ordered the Panini. Unfortunately my theory of Burgers everywhere didn’t quite pan out here. I’d definitely go back to try the Italian. Gemma scores a 7 on The Rev Meter. This entry was posted in Burgers, Gourmet Burgers, Hamburgers, New York and tagged bowery hotel, burger, cheese, ciancio, conquest, french, fries, gemma, great, hamburger, italian, new york, ny, nyc, rev, review, the, the rev meter for social community. Bookmark the permalink.